Platoo, the youngest child of four siblings, was raised by a single mother. Struggling with limited funds, Platoo’s mother found herself unable to continue supporting Platoo through junior high school. Platoo thus moved to Bangkok at the age of 15 and began work a small sewing factory, where she earned a monthly salary of 3,000 baht per month. After some time, Platoo decided to pursue new steps in her career. Finishing her high school education, she eventually earned her certification at the same time her first workplace experienced a closure. Hired at an electronic factory, she met the father of her child and remained unmarried. Because her partner declared he would no longer to be in a relationship if Platoo decided to keep their child, she left his unhealthy grasp and moved back to her hometown. Soon after, she obtained a professional certificate as a masseuse in the capital city and still works there to this day. Before finding Pratthanadee, Platoo had aims to become a more confident person and explore new career paths. Even considering a job as a tour guide, she wanted to to take advantage of her extroverted and outgoing personality, knowing learning English would help her confidence in communicating with people of all nationalities. Ultimately, she wanted to change, but didn’t exactly have the tools or skills to do so. 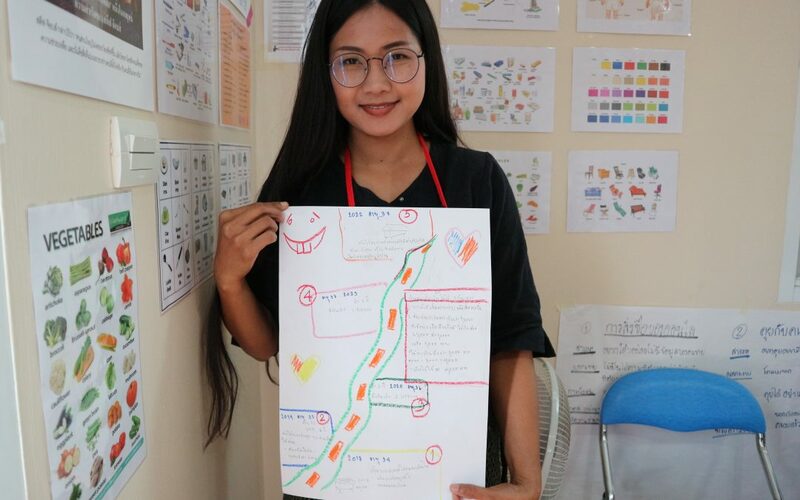 The “Better Me” program helped Platoo feel in control of her life, and she now knows exactly what she needs to do to achieve her dream: saving 1 million baht to eventually open a Thai massage parlour in her hometown. She feels her life has been completely transformed, even though she’s only been enrolled in the program for 3 months! Even more significantly, Platoo spends much of her time traveling back and forth from Nakhon Nayok to Bangkok every wednesday to attend class. Her mentor, and program coordinator, Yada Chuaychamnak, enthusiastically reports she “has never met any student who has Platoo’s level of dedication and energy.” Yada is proud to stand by Platoo’s side as a mentor and admirer, allowing Platoo to shine and showcase her true potential every week. Overall, Platoo feels grateful she was able to experience the “Better Me” program at Pratthanadee Foundation. In her progress report, she expressed sincere gratitude towards the staff, students, and donors who help shape this program to make genuine long-term impact and change the quality of life for many women in Bangkok. Platoo could not have said it any better: Pratthanadee would also like to express our sincere gratitude to the Healthy Traveler Retreats for their support. Their donations are supporting students like Platoo successfully undergo the “Better Me” program and change their lives for the better.